PBS’ hit series Masterpiece brings to audiences another gripping murder mystery this spring when it releases Grantchester on DVD and Blu-ray. 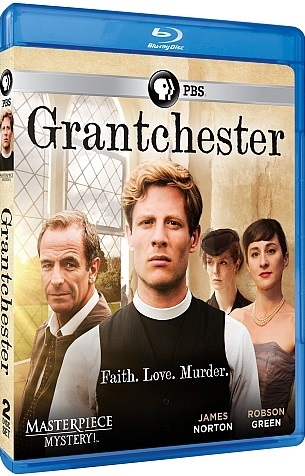 Grantchester will be released on DVD and Blu-ray on Tuesday, April 7th. The story is based on author James Runcie’s novel Sidney Chambers and the Shadow of Death. It picks up just after the end of World War II. Elizabeth II had just become queen. And Grantchester’s local priest was one of the town’s most respected figures. A lawyer in nearby Cambridge is found dead. A suicide note, a gun, and alcohol point directly to an open and shut case. But confessions to local priest Sidney Chambers reveals much more than Inspector Geordie Keating had thought. The confessions lead the pair to team up solve what turns out to be a murder. Audiences can check out a trailer for Grantchester online now via YouTube at: https://www.youtube.com/watch?v=s3tzFp5CeAU. Grantchester stars James Norton (Rush, Death Comes to Pemberly, Mr. Turner) as Sidney Chambers. He is joined by Robson Green (Being Human, Mount Pleasant, Strike Back) as Inspector Geordie Keating. Also on board for this mystery are: Morven Christie (The Young Victoria, Death in Paradise, Sirens) as Amanda Kendall, Tessa Peake-Jones (Only Fools and Horses, Casualty, Doctors) as Mrs. Maguire, Al Weaver (Sherlock, Me and Orson Welles, Doom) as Leonard Finch, and Pheline Roggan (Soul Kitchen, Chiko, Kebab Connection) as the widow of lawyer Stephen Staunton, the series’ first victim. Grantchester will be available Tuesday, April 7th on DVD and Blu-ray. The series is spread across six episodes for a total run time of 360 minutes. It is spread across two discs on both its DVD and Blu-ray release. The DVD set will retail for MSRP of $34.99 and the Blu-ray set for $39.99. Both can be ordered online along with a DVD/Book combo and Blu-ray book combo via PBS’ online store at http://www.shoppbs.org/search/index.jsp?kwCatId=&kw=grantchester&origkw=grantchester&sr=1.